The Austrian manufacturer has signed new deals with two of the biggest names in its off-road racing lineup. The secret for being successful in racing is to have stability in the team, and KTM knows this better than anyone else. The Austrian brand recently took matters in its own hands, and before other manufacturers could try and steal Tony Cairoli and Laia Sanz, KTM signed new deals with these riders. As for Italian Tony Cairoli, 9 times MX Champion at world stage, both in MX2 and MXGP, this new deal means that #222 will be racing in MXGP under Red Bull KTM Factory colors for another two years, up until the end of 2020. The 32-year-old Sicilian will start the new season of MXGP as defending champion, the first round is precisely next weekend with the Grand Prix of Patagonia, and is one of the favorites to the title this year, trying to hit a record 10th title in World Motocross. 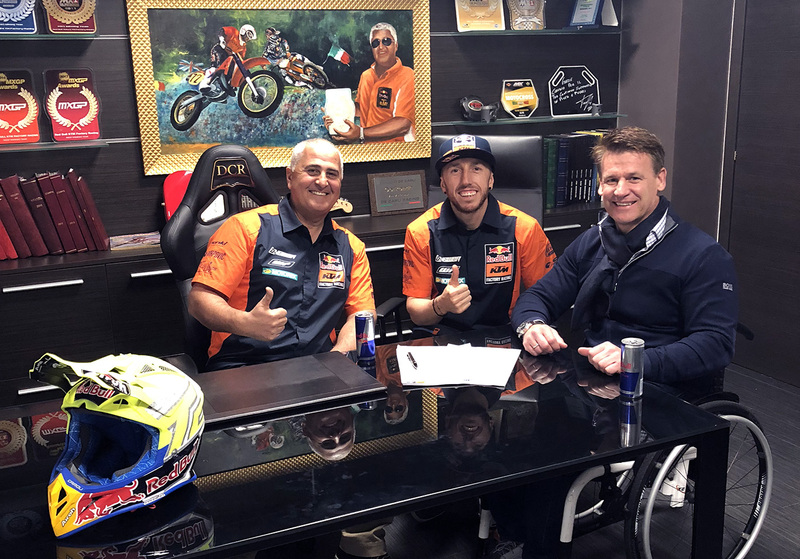 After the two-year deal was signed, Tony Cairoli said that “I’m really happy to announce this because we already made history in 2010 with the KTM 350 SX-F against the 450s and succeeded with that challenge. I feel a part of KTM because of that success and since then the company has grown a lot,” commented Cairoli. “I put in a lot of effort to bring titles and I feel very proud to be part of the company. They invest a lot and do a lot of work in development and you see the result because it is the top off-road manufacturer in the world. I’m happy to continue and to do another two years and to try for more titles. I’m fully motivated for the upcoming seasons”. After securing the top rider in Motocross, KTM then turned its attention on rally racing. The Spanish female rider Laia Sanz will also stay “orange” for two more years, until 2020, after reaching agreement for an extension of her current contract. Laia Sanz will continue to focus on cross-country rallies, especially the Rally Dakar, but she will also contest some selected Enduro events for training purposes. After all, Laia is an FIM Enduro Women World Champion. In the last Dakar, held in South America, Laia Sanz maintained her 100% finishing record intact, ending in 12th position, an admirable feat for the KTM 450 Rally rider considering the opposition, and that she rides the Dakar since 2011. The Spanish rider from Barcelona said that “I’m so pleased to sign for another two years with KTM. The whole team works together so well and to be a part of that means a lot to me. Extending my contract means I can concentrate on my riding and preparation for Dakar without too many distractions. I plan to enter some enduros each season and maybe try some new events like Erzberg for example, but my main focus will always be the Dakar. I want to say a big thank you to KTM for giving me this opportunity with the best team and I hope to reward their faith in me with some good results”.